Melamine Resin Barriers are made from the reaction of Melamine (Melamine was recently found in pet food and is known to kill dogs and cats) and Formaldehyde, and contain free Formaldehyde, but these barriers were not tested for Formaldehyde content. 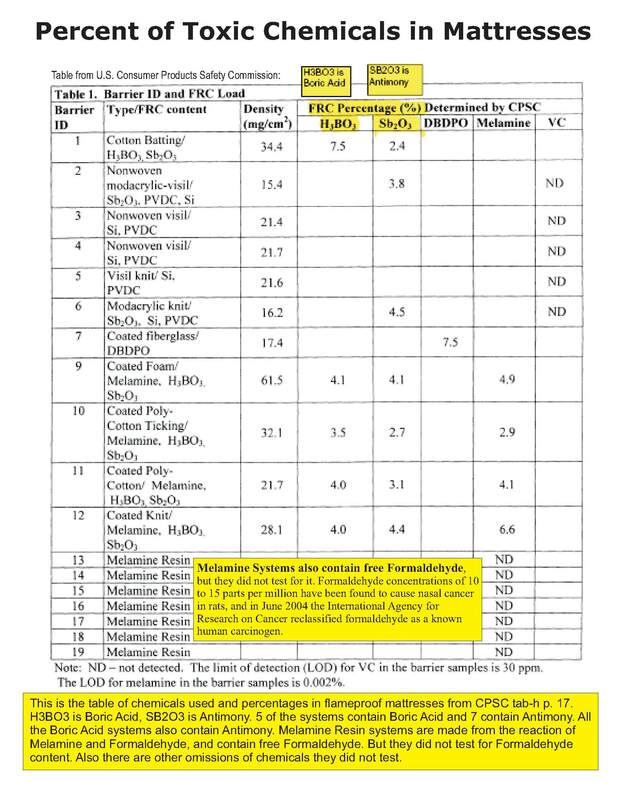 Formaldehyde concentrations of 10 to 15 parts per million have been found to cause nasal cancer in rats, and in June 2004 the International Agency for Research on Cancer reclassified formaldehyde as a known human carcinogen. 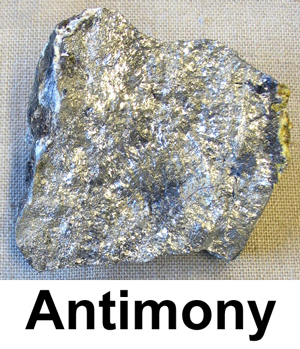 As you can see above 7 of the barriers contain Antimony and 5 contain Boric Acid. It is no wonder there are no labeling requirements for the FR chemicals used in mattresses. Which of the above systems would you choose to sleep in? We don’t think any of these systems are safe, they all have risks. 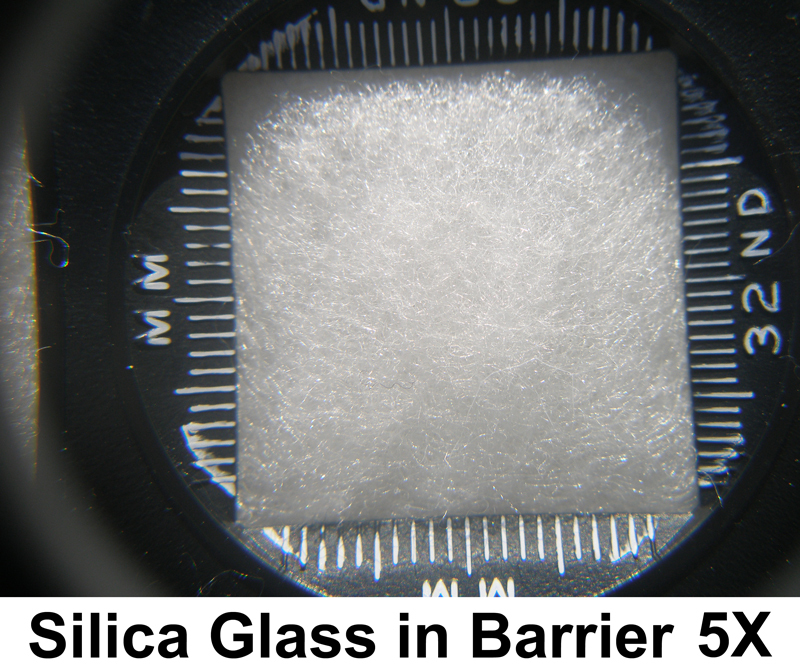 Cotton Batting barriers contain 10% poison, 7.5% Boric Acid plus 2.4% Antimony. Melamine Resin barriers contain Formaldehyde. Silicon and Formaldehyde were not studied. We keep hearing about inherently flame resistant fibers from the CPSC and mattress manufacturers. These inherently flame resistant fibers have chemicals blended with the fiber as the fiber is made. The only true inherently flame resistant fiber is fiberglass, and even that is blended with chemicals to make a barrier as you can see in the table above. Ammonium Polyphosphate is the only other chemical used to flame proof mattresses not listed above. Not as much is know of how toxic this chemical is to sleep in, but it is doubtful sleeping in and absorbing this fertilizer could be good for us, or help our children grow better. The CPSC has shown large amounts of this chemical leach from mattresses. Boric Acid, also known as the best Roach Killer, is a known reproductive and developmental toxin, a known respiratory irritant, Demonstrated injury to the gonads and to the developing fetus. high prenatal mortality, Neonatal children are unusually susceptible. There are already 6,463 U.S. cases of Boric Acid poisoning each year. One human exposure study showed reduced sperm counts and reduced sexual activity in humans. Fatal human single dose reported at: 2g Child, 5g Adult. DBDPO, Deca, is in the family of PBDE’s being found in women’s breast milk, is known to bioaccumulate, is linked to cancer, and groups are trying to get it banned. Do you want to sleep in these chemicals? Or would you rather take the one in one million risk of dying in a mattress fire? Ask your Doctor for a Prescription for a clean bed.